Dustin oversees the construction of Flaherty & Collins Properties developments, from design to build to the turnover of the site to the property management team. He is responsible for administering, supervising, and coordinating all aspects of the construction portion of a project. Dustin manages the overall budget, project documents, and schedule through coordinating in value-engineering, construction software, and critical path analysis. He shares the project vision with the development, management, and field staff to create a successful and efficient project for Flaherty & Collins Properties and its subcontractors. Dustin and his wife, Kelsi, have a daughter, Caroline. He enjoys boating, hunting, and working out and is an avid fan of the Indianapolis Colts and Indiana Pacers. 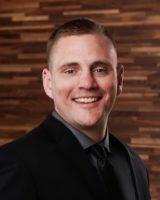 Dustin has worked in the construction field for more than 6 years, and has been involved with over $100 million in the multi-family industry. Dustin has also been enlisted in the Indiana National Guard as a member of a horizontal construction company for 11 years.